Dinner is easy and delicious if you have the right ingredients. Try our whole wheat pasta with kale, pecorino cheese and lemon zest, plus many more recipes with gnocchi. gnocchi makes it "no problem"
Gnocchi (pronounced 'NYO-kee') might be the "new pasta", but it's actually a centuries-old Italian staple. Tender, creamy Nocca® gnocchi cooks in just 2 minutes and melts beautifully with a variety of sauces and ingredients. It's the foundation of a satisfying Mediterranean meal that is delicious, easy and restaurant-worthy. Dinner in under 5 minutes? No problem! Nocca® gnocchi cooks in just 2 minutes; simply boil gnocchi in a pot of water and watch them float to the top when they're ready. Drain, season and serve! Dinner in under 5. Our original potato gnocchi is a versatile pantry staple that is the foundation for easy, satisfying and simple meals. All of our gnocchi are made with real ingredients and come in a variety of flavors to fit any occasion. 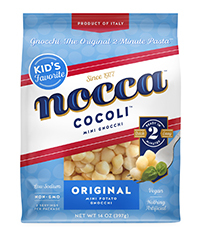 Find Nocca® gnocchi in the pasta aisle of your favorite grocery store, or Amazon, today.